Celebrating good nutrition at the EMSB. NUTRITION PASSPORT: The EMSB welcomed kindergarten students to class for the first time this week with a message to eat healthy. The formal launch of a new Nutrition Passport took place on Wednesday, August 30 at Edward Murphy Elementary School in Hochelaga-Maisonneuve. Chairman Angela Mancini visits a Kindergarten class on the first day of classes. This year, kindergarten students will embark upon a journey with OKRA, the Travel Buddy, towards discovering the colourful world of healthy foods. To fly into kindergarten, all students will receive their very own “F.A.B. 4 (Feed a Brain with the 4 Food Groups) Nutrition Passport.” This is a new initiative of the EMSB’s Nutrition and Food Services, as part of its mission to promote health-enhancing attitudes and behaviours, as well as teach much-needed skills that will help students make healthier food choices. The “F.A.B. 4 Nutrition Passport” will bring awareness of the different foods belonging to the four food groups of Canada’s Food Guide and through their journey, the kindergarten students will learn to combine these foods to create a healthy plate. The passport is filled with a variety of age-appropriate educational activities whereby students will explore a variety of foods of the food rainbow and at the same time, learn about colours, counting and shapes! The students will travel across the Green, Yellow, Blue and Red arcs of the Food Rainbow and will go on an adventure as they discover new foods that will make them feel healthy and will nourish their brains! Special guests included Chef Tigreton from The Gusto TV program The Latin Chef, professional soccer player Freddy Moojen and Montreal City Councillor Richard Celzi. His sister Cristina is the Principal of Edward Murphy. CJAD's Andrew Carter broadcast his popular morning show live from the school. 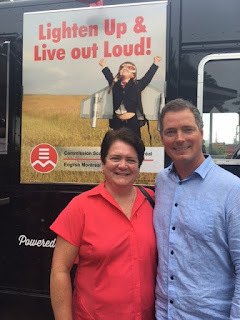 Andrew Carter and Principal Cristina Celzi. CBC Radio Noon did this program on the nutrition program. EMSB BUILDINGS: Chairman Mancini was interviewed on CBC Radio Daybreak about the CSDM's need for space. Here is the audio. OPEN HOUSES: The EMSB has enhanced its Open Houses website. Log on to www.emsbopenhouses.com. Please check it out. Ann Marie Matheson and Benoît Duhême. NEW DEPUTY DIRECTOR GENERAL: Benoît Duhême has been named EMSB Deputy Director General (Administration), succeeding Angelo Marino. Mr. Duhême has served in this role on an interim basis since last April and was legal counsel for the Board for the past 10 years. HEALTH AND SAFETY: Carmen Vizarro is the new coordinator of Health and Safety for the Human Resources Department. Carmen is returning to the EMSB, after having worked several years at our neighbouring board, LBPSB. EMSB EXPRESS: The fall edition of the EMSB Express has been published. Inside you will find special four page sections on our new Nutrition Program, entitled Eat, Grow, Learn and a recap of our 2017 Volunteer Appreciation Evening with lots of photos. At 20 pages this is our largest edition ever. Here is the link. NEW WEB PRESENCE: The EMSB has two new graphic arts technicians, who are working with Andrea. She is our current graphic arts technician/webmaster. Nur is replacing webmaster Yibing Shen, presently on maternity leave while Meghan has been hired on a special project to work closely with Andrea on creating new school websites and supporting the existing ones. We are also thrilled to announce some exciting new changes coming to our Board and school websites. The EMSB website is an important public resource for parents and students. Andrea, Nur and Meghan were working hard over the summer months preparing for some major improvements to the EMSB website. It will be relaunched with a fresh new look, easier accessibility to information and provide a better overall user experience for our visitors. The new website will be built using modern web technology that will bring the EMSB up-to-speed with the rest of the web and for people using cell phones and tablets. Using the same technology as the Board website, we are beginning a new phase for our schools by implementing this system to allow school staff to be able to more easily update and maintain their own websites. Andrea and Meghan will be beginning to work on transitioning the first schools in mid-autumn. SOCIAL MEDIA: The EMSB maintains a presence on Facebook, Instagram and Twitter. We encourage all our employees, parents and students to follow us across all social media platforms: @EnglishMTL. With a reach of over 10,000 people (up from over 4,000 at this time last year), our Facebook page has become the main conduit to disseminate pictures, videos and information to our community. Furthermore, we actively engage with parents and students, answering questions, responding to comments (positive and negative) and private messages. We will continue to use Facebook Live to broadcast events as well as conduct live interviews. Please note that any event where a member of our digital marketing team is present has the potential to be broadcast live on Facebook. Instagram has become the most popular social media outlet for youth in elementary and high school. The EMSB is active on Instagram, highlighting events through pictures and videos on a daily basis. Twitter is more popular amongst parents and the media, we use Twitter to disseminate breaking news, such as school closures and press releases. In addition to our presence on social media, when possible, we highlight various in-school activities on EMSB TV, which is disseminated via YouTube. We actively encourage our schools to film and edit their own videos, which we will share on our networks as well. SCHOOL CLOSINGS: For inclement weather, please note that we only announce school closures. These announcements are made via Twitter and Facebook. If schools remain open, which is often the case, there will be no announcement. Guerriero, John F. Kennedy High School (previously vice-principal at Willingdon); Alexander Kulczyk, LaurenHill Academy (previously a teacher at Focus School and interim vice-principal at James Lyng); Anthony Tonin, Lester B. Pearson High School (previously a teacher at John F. Kennedy High School); Amanda Vallelunga, Westmount High School (previously there on an interim basis); Giovanni Iammarrone, Westmount Park (previously there on an interim basis); Steve Spetsieris, Willingdon (previously a teacher at Vincent Massey Collegiate); Vincenzo Timpano, FACE School (previously vice-principal at Royal Vale); Gregory Watson, Mackay Centre School/Philip E. Layton (previously a teacher at Westmount Park); Holly, Kusiewicz, Marymount Academy International (previously a teacher at Parkdale Elementary in St. Laurent); Eugenia Carystios, Royal Vale School (previously a teacher at Roslyn School); Frederic Boudreault, High School of Montreal (previously vice-principal at FACE School); Nadine Pomilio, James Lyng Adult Centre (previously vice-principal at James Lyng High School); Lydia Landori, Wagar Adult Centre (previously vice-principal at Laurier Macdonald Career Centre); Darlene Kehyayan, John F. Kennedy Adult Centre (previously vice-principal at James Lyng Adult Centre); Joan MacMillan, Shadd Business Centre (previously vice-principal at Marymount Adult Centre); JoeAnne Désir, Rosemount Technology Centre (previously vice-principal at High School of Montreal Adult Centre); Marsha Excellent, Laurier Macdonald Career Centre (previously vice-principal at LaurenHill); Jimmy Giannacopoulos, St. Pius X Career Centre (previously interim vice-principal of John F. Kennedy Adult Centre); Maria Caldarella, St. Pius X Career Centre (previously vice-principal at Shadd Business Centre); and Sulaman Khan, new EMSB Welding Centre on des Grandes Prairies Blvd, (previously vice-principal at Rosemount Technology Centre). ROBOCUP: The EMSB will host Robocup 2018 next June. Here is a link from the launch. 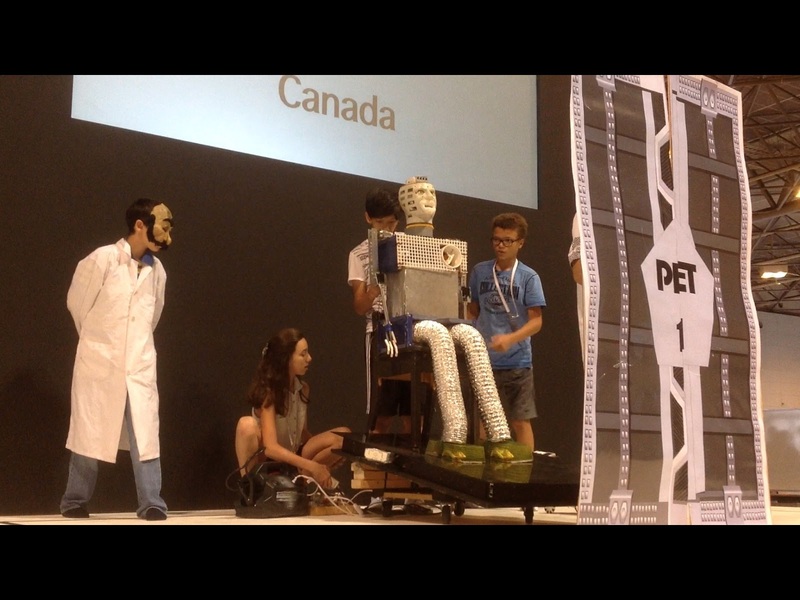 In July, Pierre Elliott Trudeau Elementary School staff and students travelled to Japan to compete in Robocup 2017. B.A.S.E. ANNUAL CONFERENCE: “No Such Thing as a Bad Kid” was the theme of this year’s EMSB Before and After School Enriched (B.A.S.E) Daycare Program Annual Conference on August 25, with youth care specialist and author Charlie Appelstein as speaker. How do we respond when a child challenges our rules and does not meet our behavioural expectations? Studies show that care and support is needed rather than time outs and punishment. How then do we equip our adults to effectively recognize and deliver that care and support in our school environment? This year’s annual daycare conference attempted to answer this important question. It was held at Prima Luna Reception Hall in the East End. EMSB Student Services also offered a workshop with Mr. Appelstein at the same venue, coordinated by Daphna Leibovici, EMSB Violence Prevention Consultant. Some 275 teachers from elementary schools and high schools were in attendance. See the press release. AWARD NOMINATION: MIND (Moving In New Directions) High School, presently based at Marymount Academy International in NDG on a temporary basis, is linked to a pretty high profile awards show. Bloom, a small independent advertising agency in Montreal, has been nominated as Philanthropist of the Year for the Bing Agency Awards for pioneering a digital advertising and digital citizenship curriculum with MIND, an alternative education high school. 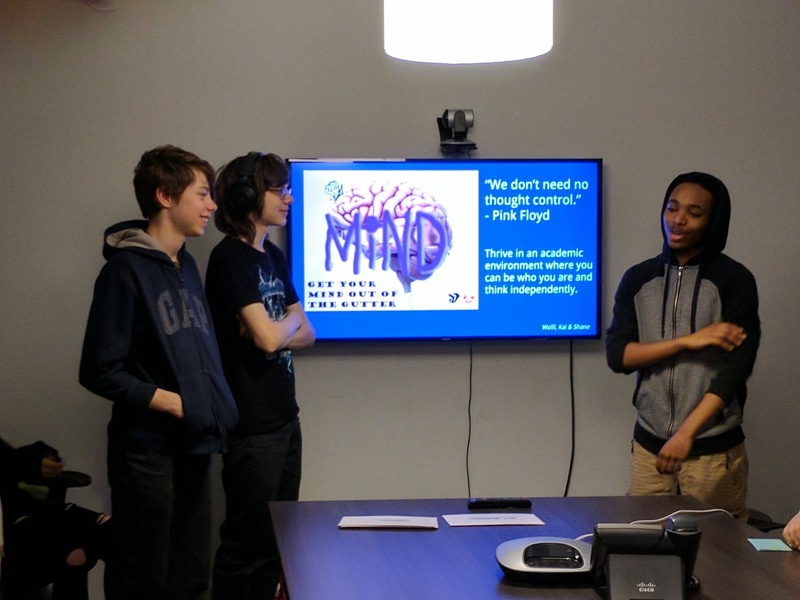 Teaming-up with the EMSB, Bloom assisted in building curriculum that taught students the basics of digital marketing with the goal to increase media literacy and build core strengths for the students, like communication, creativity, management, entrepreneurial skills and critical thinking. With Bloom’s assistance, a pilot project was undertaken at MIND, a school that has been facing declining enrolment over the last decade. Working in teams, the students were tasked with building advertising campaigns that aimed to increase awareness about the school and increase enrollment. At the end of the semester, the students presented their advertising campaigns at a local co-creation space. Having collaborated with the school board’s pedagogical consultants and teachers, we were proud to be told that student engagement and attendance increased for this specific project and that our pro-bono work and consultations were critical to the success of the pilot project. The pilot project has gained attention all across the school board and we are already planning for the new school year with further curriculum refinements led by Bloom’s digital strategy team. This new year will have up to five high schools collaborating on projects that will also involve local businesses that are digitally based. It is safe to say that the pilot project was a success. With Bloom’s commitment to helping refine the curriculum andscale to multiple schools in the 2017/18 school year, we expect to have a model for educators throughout Canada and the world. 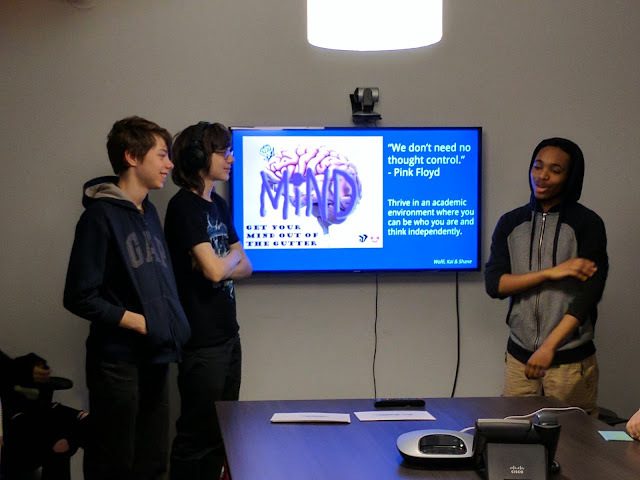 MIND students present their project. DIGITAL CITIZENSHIP: As part of the EMSB's digital citizenship initiative, two wonderful teachers at MIND - William Hesslink and Monica Paraghamian -completed a unique project. Students do not often understand how social media works, and how SM sites track young people in order to make money off them. With the help of Natalie Riviere of Cometta Communications and Sam Lalonde of Bloom Search Marketing, William and Natalie not only taught their entrepreneurship and POP students how social media uses their data to shape their online experience, but also led the students on how they could use social media and analytics to craft Facebook and Instagram advertisements to make people more aware of the great program at MIND. The students launched Facebook/Instagram ads and received great feedback from their peers who have seen their ads next to others for Nike and Apple in the social media feeds. The students unveiled their projects for industry experts at Salon 1861 in St-Henri at the end of the last school year. SINGING WITH QUEBEC ARTISTS: Pierre Elliott Trudeau Elementary School in Rosemount is one of two schools chosen to participate in a project called "Une chanson à l'école" during "Les journées de la culture" on Friday, September 29. At this time a group of students from PET will perform a song with well-known Quebec artists "Les Soeurs Boulay." It will be filmed and many schools across Quebec will participate. Teacher Caroline Cameron has coordinated this. INTERACTIVE SENSITIZATION: Before classes began at LaurenHill Academy in St. Laurent, the teachers had a chance to play the role of students as they engaged in an interactive sensitization program with Luca “LazyLegs” Patuelli. Luca guided teachers through a workshop in which they were given everyday tasks to perform without the full use of their bodies. Some of the activities required teachers to be blindfolded to simulate visual impairment, use crutches or a wheelchair to simulate the lack of mobility and/or have one arm tied behind their back to simulate limited/no use of one arm. Ultimately, the goal was to bring this unique learning experience to their students as a subtle way to transform student attitudes, behaviours and perceptions, including adaptation techniques to bullying and anxiety. TEST SCORING PILOT PROJECT: For the 2016-2017 academic year, both John Paul I Junior and Laurier Macdonald High School in St. Leonard agreed to take part in a pilot project of test scoring software and scanners. CAMtria provides these assessment packages to schools in Ontario, BC and Alberta and wanted to see what the Quebec market thought of these tools. Science department head and teacher, Pamela Léger at Laurier Macdonald High School liked several features of the scanner “I love how I can attach the PoL to each question, this feature was very useful,” she said, adding that this was a huge time saver for the school’s faculty who previously scored all tests and exams by hand. Faculty at John Paul I Jr liked their scanner so much that they decided to purchase the unit. By participating in the L2O (Loner to Owner) program, they received a scanner and 5,000 forms for only $995. The school only needs to purchase 10 packages of forms within a year to fulfill the agreement thus now owning their scanner and saving over $800. The test scanners deliver assessment reports at the push of a button. They offer fast grading, versatility, dependability and are easily maintained. Datalink Connect software, license and cost-free, is standards-friendly, Microsoft Excel-friendly, time saving and IT-friendly. If your school would like to try out this complete test scoring scanner package for free, please contact Sheila of CAMtria at 888-848- 5111 x104 (sheila@camtria.com) or log on to www.camtria.com. BRING ON THE BEARS: Elizabeth Ballantyne Elementary School (EBS) is pleased to welcome all our students, families and community members back to another school year. It’s always sad to say goodbye to summer, but the EBS staff members are looking forward to an excellent school year. The gymnasium is being renovated, and almost the whole school has been given a fresh coat of paint! There are many plans for new programs (academic, social, extra-curricular), and also to add more physical activity to the daily routine of the students and the staff members. 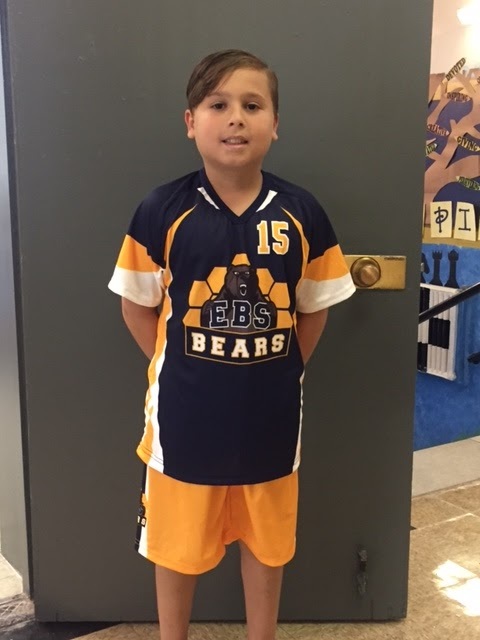 After a lengthy (and fully democratic) selection process, they have chosen the name of "EBS BEARS" for its sports teams and activities. They are very proud of the new logo; the design was created through the creativity of students, the input of the staff members, and the electronic artwork of the Marcone family. SPORTS AND WELLNESS GRANT: Kayla Segal a former student at Dunrae Gardens in Town of Mount Royal, has established the Kayla Segal Sports and Wellness Grant. The deadline to apply is September 15. Professionally Segal is a financial security advisor and independent life insurance broker. However, her passion remains competing in grueling triathlons across North America. In order to support health and wellness programs in the EMSB, she has now embarked upon an initiative to offer a grant of $1,000 to one elementary school and $1,000 to one high school in need of support to launch a physical activity or wellness related project. She has undertaken various fundraising activities to raise the money. Projects may be related to increasing opportunities for participation in physical activity, promoting good nutritional habits, addressing mental health issues via sport and/or other wellness topics. Applicants must be a member of the school community (staff member, parent, volunteer) and have the Principal’s support for grant application and implementation of the proposed project. Funds may be used to purchase equipment, materials and supplies, or hire outside personnel. For complete details go to http://www.emsb.qc.ca/sportsandwellnessgrant. ALOUETTES FUNDRAISING OPPORTUNITY: EMSB schools have a special opportunity to purchase tickets from the Montreal Alouettes in bulk and use it as a simple fundraiser at the same time. Every participating school will receive a unique link and promo code. Purchasers can print the tickets from their home or office. Anyone who wishes to do this the old fashioned way can call John Di Terlizzi at 514-787-2755 or e-mail him at jditerlizzi@montrealalouettes.com and he will handle the request. Tickets are $16 each, with $3 going back to each school. GENERATIONS BREAKFAST: The Generations Foundation will hold its annual Back to School Bagelothon at St. Viateur Bagel & Café, at 5629 Monkland Avenue in NDG on September 14. Again this year, people can put in their order and whatever proceeds from bagel sales picked up and/or breakfasts enjoyed at the event (6 am to 10 am) will be donated to Generations Foundation, which provides hot meals to hungry students and also provides summer camp experiences. WELCOMING REFUGEES: The EMSB has responded to an urgent request from the Centre intégré universitaire de santé et de service sociaux (CIUSSS) du Centre-Ouest-de-l'Île-de-Montréal, which is responsible for immigration resettlement on the island of Montreal. On a daily basis, refugees are crossing the border into Canada from the United States and appropriate shelters are in serious shortage. The CIUSS and Ministry of Education have asked school boards if they can help. The EMSB has responded to this urgent request by allowing a vacant school to be used as a shelter. The building, located on Henri Julien and Cremazie, will be donated temporarily to this cause for a period of up to one year as the EMSB's contribution to this crisis situation. EMSB Chairman Angela Mancini noted that the Board is presently closed for the usual two week summer break, but many directors and staff are working to respond to this call for help. "I am pleased that we that we will be able to assist," said Ms. Mancini. "We all want to do our part to help families who need a roof over their heads. At present, the former St. Raphael School building is empty and not being used by our EMSB community. So we are pleased to be able to allow the Red Cross to use it for the good of others." Kyle Briggs and Devon Packer. 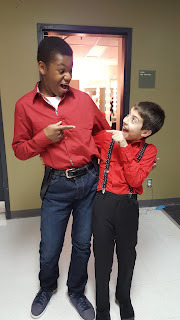 JUST FOR LAUGHS: Devon Packer and Kyle Briggs, students at Royal Vale Elementary School in NDG, appeared in the "Kids Cabaret/Gala de Ouf" as part of the Just for Laughs Festival at the Place des Arts. ATTENTION HIGH SCHOOL FRENCH TEACHERS: Through the organization Canadian Parents for French and the Communications and Marketing Division of the EMSB, the 2017 23rd edition of Cinemania (November 2 to 12) is reaching out to French high school teachers to organize field trips to this year’s program. The films are in French and they all have sub-titles. Everything shown represents a North American premiere. Special screenings for students has been part of their agenda for years. The idea is simple: to make the cinema accessible to young people while having a pedagogical approach. This year three films have been chosen that represent good fits. LES ENFANTS DE LA CHANCE tells the true story of Jewish children gathered in a hospital during the rafle du Vel d'Hiv (Vel d'Hiv Roundup) during WWII. KISS & CRY (Festival de Cannes 2017 - Sélection de l'ACID) tells the story of Sarah, a young competitive skater. DE TOUTES MES FORCES shares the story of Nazism, a teenager who loses his mother and finds himself in a group foster home, which he wants to hide from his friends. For more information contact Antoine Corfu at 514 878-2882 or antoine@festivalcinemania.com. Log on to www.festivalcinemania.com. 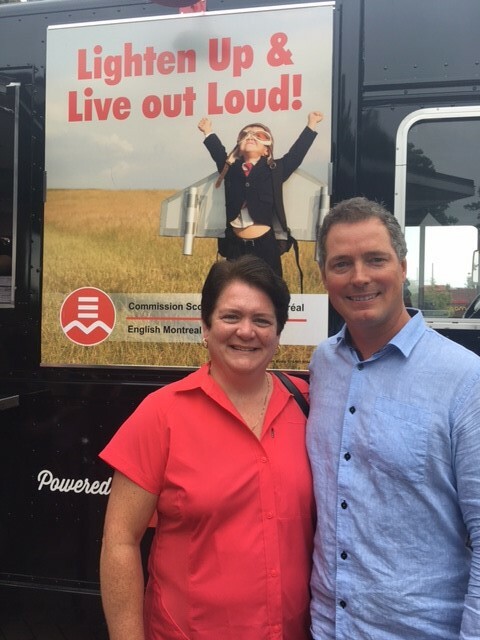 WAGAR ADULT CENTRE: The EMSB is reaching back into its past with the announcement that the Marymount Adult Education Centre in Côte Saint-Luc has been renamed the Wagar Adult Education Centre. Wagar High School occupied the Parkhaven Avenue building from 1963 until its closure in 2005. The Marymount Adult Education Centre, which previously shared the premises of the Marymount Academy International on Côte Saint-Luc Road in NDG, relocated to the building in September 2005. The facility also serves as the home of the C.A.R.E. Centre, which offers services to adults over the age of 21 with physical disabilities and John Grant High School, which caters to special needs students. “For the past 12 years we have had two schools called Marymount, leading to some confusion,” stated EMSB Commissioner for Côte Saint-Luc Bernard Praw. “I have spoken to many people in the community over the past year, from private citizens to the mayor, and there was a great desire to bring the Wagar name back. In fact, since Wagar closed as a high school most people still refer to it as the name of the building.” Last year the auditorium in the building was named after the late Syd Wise, the respected former Wagar principal and school commissioner who passed away in November 2015. “I know that Syd very much wanted to see the Wagar name returned,” said EMSB Chairman Angela Mancini. At one point in the 1970s, Wagar High School had more than 1,700 students. The school was named after a former Protestant School Board of Greater Montreal Commissioner named Roy Wagar, who passed away in 1962. The Marymount Adult Education Centre has over 1,800 students, offering day and evening courses to adults aged 16 and over in French and English catering mainly to new Canadian citizens and landed immigrants learning the languages. The school also has a large special needs population and operates satellite classes in different locations across the city. PASSEPORT-NUTRITION: À la CSEM, la rentrée des élèves de la maternelle a eu lieu cette semaine sous le signe de la saine alimentation. Le lancement officiel du nouveau Passeport-nutrition s’est déroulé le mercredi 30 août à l’école primaire Edward Murphy située dans le quartier Hochelaga-Maisonneuve. Cette année, les élèves de la maternelle partiront à l’aventure avec Okra, leur compagnon de voyage, pour découvrir l’univers coloré des aliments santé. Au moment de s’envoler vers la maternelle, tous les élèves recevront un Passeport-nutrition M.É.G.A. 4 (Manger Équilibré, c’est Gagnant pour Apprendre avec les 4 groupes alimentaires). Cette nouvelle initiative de l’équipe de la Nutrition et des services alimentaires de la CSEM s’inscrit dans le cadre de sa mission ayant pour but de promouvoir des attitudes et des comportements pour améliorer la santé et de transmettre aux élèves les connaissances dont ils ont grand besoin en vue de les aider à choisir des aliments nutritifs. Grâce au Passeport-nutrition M.É.G.A. 4, ils pourront se familiariser avec les différents aliments appartenant aux quatre groupes du Guide alimentaire canadien. Tout au long de leur périple, les élèves de la maternelle verront comment créer un repas santé à partir des quatre groupes d’aliments. Ce passeport renferme une foule d’activités éducatives adaptées à leur niveau qui leur permettront de découvrir divers aliments de l’arc-en-ciel alimentaire tout en apprenant à reconnaître les couleurs, les chiffres et les formes! Ils exploreront les arcs vert, jaune, bleu et rouge de l’arc-en-ciel et, tout au long de cette belle aventure, ils feront connaissance avec de nouveaux aliments pour grandir en santé et nourrir leur cerveau! MESSAGES PUBLICITAIRES SUR CTV: La CSEM a dévoilé ses nouveaux messages publicitaires qui seront diffusés sur les ondes de CTV en septembre et en octobre afin de promouvoir la saison des portes ouvertes. Ces messages mettent en vedette la présidente de la CSEM, Angela Mancini, ainsi que six élèves. Pour voir ces messages, cliquez ici. PORTES OUVERTES : La CSEM a amélioré et mis à jour son site Web qui renferme l’information relative aux portes ouvertes dans ses écoles (www.emsbopenhouses.com). Nous vous invitons à y jeter un coup d’œil. SANTÉ ET SÉCURITÉ: Carmen Vizarro s’est jointe au Service des ressources humaines à titre de nouvelle coordonnatrice en santé et sécurité. Carmen fait un retour à la CSEM après avoir travaillé plusieurs années à la Commission scolaire Lester-B.-Pearson. L’ÉQUIPE WEB GRANDIT: La CSEM compte désormais deux nouvelles techniciennes en arts graphiques qui se joignent à Andrea Di Tomaso, technicienne en arts graphiques/webmestre. Nur Erdem remplace la webmestre Yibing Shen, présentement en congé de maternité. Par ailleurs, Meghan Dove a été embauchée dans le cadre d’un projet spécial afin d’épauler Andrea dans la création de nouveaux sites Web pour nos écoles et d’assurer le soutien pour les sites actuels. Nous sommes ravis de vous annoncer que des changements appréciables seront apportés au site Web de la Commission et à ceux de nos écoles. Le site de la CSEM s’avère une précieuse source de renseignements tant pour les parents que les élèves. Andrea, Nur et Meghan ont travaillé d’arrache-pied tout l’été en vue de se préparer en prévision des améliorations majeures qui seront apportées au site Web de la CSEM. Le nouveau site fera peau neuve, facilitera l’accès à l’information et offrira à nos visiteurs une meilleure expérience utilisateur. Nous aurons recours à une technologie Web de pointe pour actualiser notre site et répondre aux besoins des utilisateurs de cellulaires et de tablettes. Grâce à cette même technologie, nous nous engagerons prochainement dans une nouvelle phase qui, de par la mise en œuvre de ce système, permettra au personnel des écoles d’être en mesure de mettre à jour et de gérer plus aisément leur propre site Web. Andrea et Meghan entameront la transition des premières écoles vers le milieu de l’automne. FERMETURES D’ÉCOLES: En cas de mauvais temps, veuillez prendre note que nous annonçons uniquement les écoles qui sont fermées. Ces annonces se font par l’entremise de Twitter et Facebook. Si les écoles sont ouvertes, ce qui est souvent le cas, aucune annonce ne sera faite. CONFÉRENCE ANNUELLE DE B.A.S.E. : Cette année, la conférence annuelle des services de garde B.A.S.E. (Before and After School Enriched) a eu lieu le 25 août sous le thème No Such Thing as a Bad Kid (« Il n’y a pas de mauvais enfants »). L’auteur et conférencier Charlie Appelstein invité à cette occasion s’est adressé à l’ensemble des éducateurs réunis. Comment doit-on réagir lorsqu’un enfant défie les règles et n’adopte pas les comportements que l’on attend de lui? Les études démontrent que l’attention et le soutien sont à privilégier plutôt que les périodes de réflexion (temps d’arrêt) et les punitions. Ceci dit, comment peut-on outiller nos adultes pour reconnaître et offrir efficacement l’attention et le soutien nécessaire dans un cadre scolaire? La conférence annuelle cette année a tenté de répondre à cette question fort importante. La conférence a eu lieu à la salle de réception Prima Luna dans l’est de Montréal. Les Services aux élèves de la CSEM ont également offert un atelier avec M. Appelstein au même endroit, coordonné par Daphna Leibovici, conseillère en prévention de la violence à la CSEM. Quelque 275 enseignants des écoles primaires et secondaires ont pris part à cet atelier. Nous vous invitons à lire le communiqué. AVIS AUX ENSEIGNANTS DE FRANÇAIS DU SECONDAIRE : Par l’entremise de l’organisme Canadian Parents for French (Parents canadiens en faveur du français) et du Service des communications et du marketing de la CSEM, la 23e édition de CINÉMANIA (du 2 au 12 novembre 2017) lance un appel aux enseignants de français du secondaire pour qu’ils organisent des sorties dans le but de visionner la programmation de cette année. Les films présentés sont en français et sont tous sous-titrés. Dans tous les cas, il s’agit de premières en Amérique du Nord. Les projections spéciales à l’intention des élèves sont au programme depuis des années. Le principe est bien simple : rendre le cinéma accessible aux jeunes dans le cadre d’une approche pédagogique. Cette année, trois films ont été sélectionnés pour ce public. LES ENFANTS DE LA CHANCE raconte l’histoire vécue d’enfants juifs réfugiés dans un hôpital durant le raid du Vel d'Hiv (Vel d'Hiv Roundup) lors de la Seconde Guerre mondiale. KISS & CRY (Festival de Cannes 2017 - Sélection de l'ACID) relate l’histoire de Sarah, une jeune patineuse de compétition. DE TOUTES MES FORCES présente l’histoire de Nassim, un adolescent qui à la suite du décès de sa mère se retrouve dans une famille d’accueil et tente de le cacher à ses amis. Pour de plus amples renseignements, veuillez communiquer avec Antoine Corfu au 514 878-2882 ou à antoine@festivalcinemania.com. Visitez le www.festivalcinemania.com. PROJET PILOTE DE CORRECTION D’EXAMENS: L’école secondaire du premier cycle John Paul I et l’école secondaire Laurier Macdonald à Saint-Léonard ont toutes deux accepter de prendre part, durant l’année scolaire 2017-2018, à un projet pilote de logiciel et de numériseurs pour la correction des examens. CAMtria, qui fournit déjà des trousses d’évaluation à des écoles de l’Ontario, de la Colombie-Britannique et de l’Alberta, souhaitait connaître l’opinion du marché québécois à l’égard de ces outils. Pamela Léger, enseignante et responsable du département des sciences à l’école secondaire Laurier Macdonald a bien apprécié plusieurs fonctions offertes par le numériseur. « J’ai adoré la fonction permettant de joindre la progression des apprentissages à chacune des questions, c’est très utile », a-t-elle souligné. Elle a également fait remarquer l’importante économie de temps pour les enseignants qui corrigeaient auparavant tous les examens et toutes les épreuves à la main. Le personnel enseignant de l’école John Paul I a tellement aimé le numériseur que l’école a décidé d’en faire l’achat. Grâce au programme L2O (Loaner to Owner), l’école a reçu un numériseur et 5 000 formulaires pour la modique somme de 995 $. En vue de respecter l’entente, l’école n’a qu’à acheter 10 paquets de formulaires durant l’année pour ainsi être propriétaire de son numériseur et économiser plus de 800 $. Il suffit d’appuyer sur une touche pour que les numériseurs d’examens génèrent des rapports d’évaluation. Ils permettent la correction rapide des examens, en plus d’être polyvalents, fiables et faciles d’entretien. Le logiciel Datalink Connect, qui ne comporte aucuns frais ni licence, s’adapte aux normes, permet de gagner du temps et est compatible avec le programme Excel de Microsoft ainsi que les systèmes informatiques. Si votre école souhaite faire l’essai gratuit de ce nouveau numériseur pour la correction des examens, veuillez communiquer avec Sheila de CAMtria au 888 848 5111, poste 104 (sheila@camtria.com) ou visitez le www.camtria.com. BOURSE POUR LE SPORT ET LE MIEUX-ÊTRE : Kayla Segal, ancienne élève de l’école primaire Dunrae Gardens à Ville Mont-Royal, a créé la Bourse Kayla Segal pour le sport et le mieux-être. Mme Segal est conseillère en sécurité financière et courtière indépendante en assurance vie. Toutefois, sa véritable passion l’amène à prendre part à d’éreintants triathlons partout en Amérique du Nord. Dans le but d’appuyer les programmes axés sur la santé et le mieux-être à la CSEM, elle a lancé une initiative visant à octroyer deux bourses, soit 1 000 $ à une école primaire et 1 000 $ à une école secondaire pour les aider à mettre sur pied un projet lié à l’activité physique ou au mieux-être. Elle a organisé diverses activités de financement pour amasser ces fonds. Les projets proposés doivent encourager une pratique accrue de l’activité physique, promouvoir de saines habitudes alimentaires, aborder les problèmes de santé mentale par le sport ou porter sur d’autres sujets liés au mieux-être. La candidature doit être présentée par un membre de la communauté scolaire (employé, parent, bénévole) et la direction doit donner son appui à l’affectation des fonds et à la mise en œuvre du projet proposé. Les fonds pourront servir à l’achat d’équipement, de matériel et de fournitures ou à l’embauche de personnel externe. Pour en savoir davantage, visitez le http://www.emsb.qc.ca/sportsandwellnessgrant. NOUVELLES ÉCOLES STIAM : La CSEM a annoncé l’expansion de son fort populaire programme STIAM pour l’année scolaire 2017-2018. Le programme STIAM (sciences, technologies, ingénierie, arts et mathématiques) est une initiative multidisciplinaire qui vise à favoriser la créativité chez les élèves ainsi qu’une participation poussée de leur part dans la réalisation d’une série de projets de groupe, en abordant non seulement les cinq matières enseignées à l’école mais aussi en rendant ces projets plus pertinents, plus créatifs, plus intéressants et davantage axés sur la découverte. STIAM est une approche pédagogique ayant pour objectif de promouvoir un esprit inquisiteur, un raisonnement logique et des compétences en matière de collaboration. Dix autres écoles primaires se joindront aux deux écoles pilotes Général Vanier à Saint-Léonard et Pierre Elliott Trudeau à Rosemont. Il s’agit des écoles suivantes : Elizabeth Ballantyne à Montréal-Ouest, Pierre de Coubertin et Honoré-Mercier à Saint-Léonard, Coronation à Côte-des-Neiges, Westmount Park à Westmount, Carlyle à Ville Mont-Royal; Gardenview à Saint-Laurent, Michelangelo à Rivière-des-Prairies; Dalkeith à Anjou et Bancroft sur le Plateau. Deux écoles secondaires prendront également part à ce programme : John Paul I à Saint-Léonard et James Lyng à Saint-Henri. DÉJEUNER AVEC LA FONDATION GÉNÉRATIONS: La Fondation Générations tiendra le 14 septembre prochain son Bagel-O-thon annuel de la rentrée à St-Viateur Bagel & Café situé au 5629, avenue Monkland à NDG. Encore une fois cette année, les gens peuvent commander à l’avance. Tous les profits découlant de la vente de bagels commandés ou de déjeuners dégustés sur place lors du Bagel-O-thon (de 6 h à 10 h) seront versés à la Fondation Générations qui offre des repas chauds aux élèves affamés et qui permet à des jeunes de vivre l’expérience des camps d’été. CENTRE D’ÉDUCATION DES ADULTES WAGAR: La CSEM fait un retour dans le temps en annonçant que le Centre d’éducation des adultes Marymount à Côte Saint-Luc a été rebaptisé le Centre d’éducation des adultes Wagar. L’école secondaire Wagar a occupé le bâtiment situé sur l’avenue Parkhaven de 1963 jusqu’à sa fermeture en 2005. Le Centre d’éducation des adultes Marymount, qui partageait auparavant les locaux avec l’Académie internationale Marymount sur le chemin de la Côte-Saint-Luc à NDG, a été relocalisé dans l’ex-bâtiment Wagar en septembre 2005. Cet endroit abrite également le Centre C.A.R.E. qui dispense des services aux adultes âgés de plus de 21 ans souffrant de déficiences physiques ainsi qu’aux élèves ayant des besoins particuliers de l’école secondaire John Grant. « Depuis les 12 dernières années, nous avions deux écoles Marymount, ce qui portait à confusion », a déclaré le commissaire de la CSEM dans Côte Saint-Luc Bernard Praw. « J’ai consulté un grand nombre de personnes au sein de la communauté au cours de la dernière année, allant des citoyens jusqu’au maire lui-même, et j’ai été à même de constater un profond désir de restaurer le nom Wagar. De fait, depuis la fermeture de l’école secondaire Wagar, la plupart des gens connaissent encore ce bâtiment sous le nom Wagar. » L’an dernier, l’auditorium a été rebaptisé à la mémoire du défunt Syd Wise, ancien directeur fort respecté de l’école Wagar et commissaire qui s’est éteint en novembre 2015. « Je sais que Syd souhaitait ardemment restaurer le nom Wagar », de dire la présidente de la CSEM Angela Mancini. À une certaine époque dans les années 1970, l’école secondaire Wagar comptait plus de 1 700 élèves. Elle avait été nommée à la mémoire de Roy Wagar, ancien commissaire de la Commission des écoles protestantes du Grand Montréal, décédé en 1962. Le Centre d’éducation des adultes Marymount regroupe plus de 1 800 élèves et offre des cours de jour et de soir, en français et en anglais, aux adultes âgés de 16 ans et plus, pour la plupart de nouveaux citoyens canadiens et immigrants qui apprennent ces deux langues. Cet établissement dessert également une forte population d’élèves ayant des besoins particuliers et compte des classes satellites dans divers secteurs de la ville. The next Focus will be published on September 28, 2017. Submissions should be made to Michael J. Cohen preferably by e-mail (mcohen@emsb.qc.ca) by September 22 at Noon.